The island of Morbus is located somewhere near the middle of the Great Toonolian Marshes, likely about halfway between Phundahl on the western end and Toonol on the eastern end. There, the experiments of the Ras Thavas, the Master Mind of Mind, have taken on a Frankensteinian dimension: the creation of the Hormads. 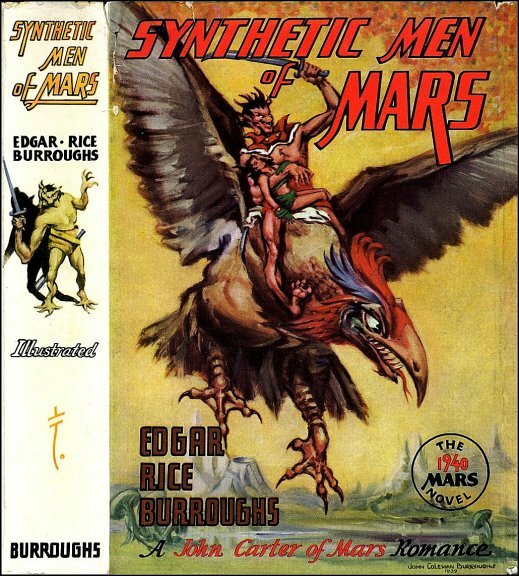 This story is documented in ERB's ninth Barsoomian novel, The Synthetic Men of Mars. The genius scientist-surgeon faces many foes as he relentless conducts his unlimited research, unguided by any ethical principles. innovation is possible when a red Martian puts his mind to something. His story is translated by Vad Varo, aka Ulysses Paxton, then communicated to ERB by means of the Gridley Wave. In this story ERB must have had some of the most fun in his writing career. Having given so much detail about Martian culture to his reading audience in previous novels, he felt totally comfortable telling this story from a Barsoomian point of view, an experiment he tried successfully before in A Fighting Man of Mars, the seventh novel in the series. This time, however, the narration takes a delightful turn in that Vor Daj mostly relates his story from the body of a Hormad. “Upon an island near Toonol, Ras Thava, The Master Mind of Mars, had labored in his laboratory for nearly a thousand years until Vobis Kan, Jeddak of Toonol, turned against him and drove him from his island home and later repulsed a force of Phundahlian warriors led by Gor Hajus, the Assassin of Toonol, which had sought to recapture the island and restore Ras Thavas to the laboratory upon his promise to devote his skill and learning to the amelioration of human suffering rather than to prostitute them to the foul purposes of greed and sin. Carthoris, Tara and Thuvia plead that Carter take someone else with him and, giving in for once, he chooses Vor Daj to accompany him on a journey to Duhor, the home of Vad Varo, hoping that he will know the location of Ras Thavis. Vad Varo could also stand in for a reliable substitute if Ras Thavas cannot be found, for he had been trained in many of Ras Thavis’ surgical techniques. They set off in a flier from the roof of the Warlord’s palace, set the directional compass for Duhor, but, of course, the reliable mechanism never seems to work for our hapless heroes, and after taking a slumber, they discover they are way off course, nearer to Phundahl than Duhor. “We whipped our longswords from their scabbards and met the five horrific creatures, standing back to back as they circled us. The blade of the Warlord wove a net of razor edged steel before him, while I did the best that I could to defend my prince and uphold the honor of my metal; and I did well, for I am accounted a great swordsman by John Carter himself, the greatest of all. Our antagonists were no match for us. They could not pierce our guards, even though they fought with a total disregard of life, throwing themselves upon our blades and coming in again for further punishment. And that was the disheartening feature of the horrid encounter. Time and again I would run a fellow through, only to have him back away until my blade was out of his body and then come at me again. They seemed to suffer from neither shock nor pain and to know no fear. My blade severed the arm of one of them at the shoulder; and while another engaged me, the fellow stooped and recovered his sword with his other hand and tossed his severed arm to one side. John Carter decapitated one of his antagonists; but the body ran around cutting and slashing in apparent ungovernable fury until the dwar ordered several of his other warriors to capture and disarm it, and all the while the head lay gibbering and grimacing in the dust. This was the first of our antagonists to be rendered permanently hors de combat, and suggested the only way that we might be victorious. “‘Behead them, Vor Daj!’ the Warlord directed, and even as he spoke he lopped the head from another. What is the most fun in this account is to hear the story, normally told by John Carter, from another person’s perspective. ERB’s narrative genius keeps both characters true to their form, which is difficult to accomplish from another point of view. The person of John Carter is not diminished as a cardboard figure, which can often happen in the hands of a lesser writer. “Our course lay south of Phundahl, which the leader was evidently seeking to avoid; and ahead I could see the vast Toonolian Marshes stretching away in the distance as far as the eye could see – a labyrinth of winding waterways threading desolate swampland from which rose occasional islands of solid ground, with here and there a darker area of forest and the blue of tiny lakes. “As I watched this panorama unfolding before us, I heard a voice suddenly exclaim, querulously, ‘Turn me over. I can’t see a thing but the belly of this bird.’ It seemed to come from below me; and glancing down, I saw that it was the head in the net beneath me that was speaking. It lay in the net facing upward toward the belly of the malagor, helpless to turn or move itself. It was a gruesome sight, this dead thing speaking; and I must confess that it made me shudder. “‘What are you called?’ it asked. “‘Thanks,’ I said. I wondered what good a friend without a body could do me. I also wondered if shaking the net for the thing would outweigh the fact that I had lopped its head off. Just to be polite, I asked what its name might be. Vor Daj muses on the name, for in Martian, it means four-million-eight. The hormad in front of Vor Daj tells him to pay no attention to Tor-dur-bar because he is an upstart, and tells him that he would make a much better friend. His name is Teeaytan-ov, which means, elevenhundred-seven. The two hormads get into an argument and the dwar, Sytor, has to break it up after Teeaytan-ov threatens to dump Tor-dur-bar into the swamps below. Carter’s malagor rides in front of Vor Daj and the woman’s malagor rides a little to his left as they fly at a speed of sixty miles per hour. They dismount and are taken through the main gate, the arms and heads are assigned to Laboratory No. 3, and Carter and Vor Daj are taken into the city, but not before Tor-dur-bar reminds Vor Daj that he is his friend and the other hormad is but an experiment. “‘For what purpose do they keep prisoners?’ asked John Carter. “‘He is that – a prisoner in his own city, the servant of the hideous creatures he has created,’ replied Gan Had of Toonol. “‘I don’t follow you,’ said John Carter. “‘After Ras Thavas was driven from his laboratories by Vobis Kan, Jeddak of Toonol,’ explained Gan Had, ‘he came to this island to perfect a discovery he had been working on for years. It was the creation of human beings from human tissue. He had perfected a culture in which tissue grew continuously. The growth from a tiny particle of living tissue filled an entire room in his laboratory, but it was formless. His problem was to direct this growth. He experimented with various reptiles which reproduce certain parts of their bodies, such as toes, nails, and limbs, when they are cut off; and eventually he discovered the principle. This he has applied to the control of the growth of human tissue in a highly specialized culture. The result of these discoveries and experiments are the hormads. Seventy-five per cent of the buildings in Morbus are devoted to the culture and growth of these horrid creatures which Ras Thavas turns out in enormous numbers. “‘But can these half-humans hope to be victorious over well trained, intelligent troops fitted for modern warfare?’ I asked. “‘How large an army have they?’ inquired John Carter. They are interrupted by chow time, brought to them by a couple of hormads carrying a vessel containing animal tissue for their evening meal. It is an “ask not, don’t tell” kind of situation where hunger overrules conscience. They discover that the hormads are ruled by a council of seven jeds, intelligent hormads who have had Ras Thavas transfer their brains into those of comely and strong red men. The council will decide the fate of the prisoners, with Janai likely going to one of the jeds. Vor Daj befriends the girl and tells her he would like to help her, but they are taken to the council before they can get to know each other better. because Helium is so distant they couldn’t possibly feel any partiality to either Phundahl or Toonol. Janai smiles pathetically at Vor Daj as they are taken away. has black hair, and he is not Vad Varo, that he must be the famous John Carter. He asks Carter his opinion about Vad Varo, taking his word that he is faithful and loyal. Carter tells Ras Thavas about his princess, but Ras Thavas assures him that there is no way to escape the Council of Seven Jeds, then they are interrupted by a situation in one of the culture vats. “Ras Thavas led us to an enormous room where we beheld such a spectacle as probably never had been enacted elsewhere in the entire universe. In the center of the room was a huge tank about four feet high from which were emerging hideous monstrosities almost beyond the powers of human imagination to conceive; and surrounding the tank were a great number of hormad warriors with their officers, rushing upon the terrible creatures, overpowering and binding them, or destroying them if they were too malformed to function successfully as fighting men. At least fifty per centum of them had to be thus destroyed – fearful caricatures of life that were neither beast nor man. One was only a great mass of living flesh with an eye somewhere and a single hand. Another had developed with its arms and legs transposed, so that when it walked it was upside down with its head between its legs. The features of many were grotesquely misplaced. Noses, ears, eyes, mouths might be scattered indiscriminately anywhere over the surfaces of torso or limbs. These were all destroyed; only those were preserved which had two arms and legs and the facial features of which were somewhere upon the head. The nose might be under an ear and the mouth above the eyes, but if they could function appearance was of no importance. “Ras Thavas viewed them with evident pride. ‘What do you think of them?’ he asked The Warlord. “‘Quite horrible,’ replied John Carter. They proceed on to another room where reconstruction work is being carried out; heads are growing new bodies. They see a head sprouting a leg and the head is very angry about it, becoming abusive toward Ras Thavas, who threatens to redirect him to the culture vat, and the head screams for him not to do it. “‘Why should a thing like that wish to live?’ I asked, after we had passed along. “‘It is a characteristic of life, however low its form,’ replied Ras Thavas. “‘If there is an Almighty God he may resent this usurpation of his prerogatives,’ remarked The Warlord with a smile. prodigious strength, though one of his arms is much longer than the other. Vor Daj succeeds in his plan and witnesses the brain transfer, which gives him a new daring idea: he will have his own brain transplanted into Tor-dur-bar’s old body, and with Tordur-bar a bodyguard for one of the jeds, he too – with his profound strength and Tor-dur-bar’s help – can gain employment as a bodyguard and thus hopefully protect Janai. Thus the scene is set for one of the greatest works of the imagination in pulp fiction. As the plot progresses, Carter and Ras Thavas hide Vor Daj’s body in cell 17 in the pits, discovering an ancient tunnel that leads them to a secret island outside of the area of the hormads. Vor Daj, now in Tor-dur-bar’s old body, stumbles upon the tunnel and meets up with his old comrades. This story is too good to give any more away. The reader should have the pleasure of discovering the rest for him or herself. This is all that is necessary in the way of data about the Island of Morbus that we need to know for this article. With Ras Thavas’ recreation of the extinct malagors, I couldn’t help thinking about the late Michael Crichton’s Jurassic Park, and it’s famous line, “nature will find a way.” This especially comes into play in Vat Number 4, where a monster Blob of animal tissue threatens to overcome the whole planet of Barsoom. Crichton was a modern master of the cliff-hanger and often returned to this theme that he had started in The Andromeda Strain. I have no idea if he ever read ERB, but I like to think he did and was influenced by the master. I remember when I was attending Artillery OCS in Ft. Sill, Oklahoma from October 1969 to February 1970, that many a fortunate son of the America aristocracy were among my classmates. A General’s son even committed suicide while I was there. Anyway, this does not diminish Mr. Servello’s article and it is worth the reading just the same. Interestingly, I had read his article shortly after finishing mine and had already realized my error as to the real Mars. It is an excellent article and worth reading. Even though I was mainly thinking about ERB’s imaginary Barsoom and the science and math involved in figuring out the time of the Barsoomian clock, I took note to be more careful in my wording in the future and I appreciated the correction. By the way, Mr. Ekman arrived at the same calculation as I did for 11 xats past the 8th zode. If anyone has any further criticism about any of my articles posted on ERBzine, I can be reached at woodrownichols@aol.com. All comments and criticisms are welcome. After all, we are all human, and not – thank the Maker – hormads. ERB’s Third Runner-up in the Seven Wonders of Barsoom: The Island of Morbus!